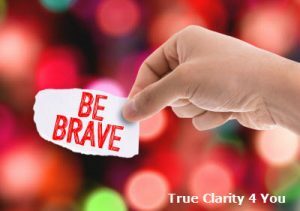 Finding the personal courage to ask for what you want—and setting boundaries around what you don’t want—takes bravery. 1. Send a Clear Message. Being assertive starts with knowing what you are—and aren’t—willing to be, do, or have. For many of us, coming to this knowledge is a real task unto itself. Here, it may be useful to ask: “In an ideal world, what would I like to happen?” Focusing on an ideal outcome opens our minds, prevents us from falling into passivity or “victim-thinking,” and helps us get clear on what we want and don’t want. 2. Stake Out Your Boundaries. Once you know what outcome you need (or want), share it. Pay attention to the way stating your boundary feels in your body. With practice, you can sense when you’re standing strong in your truth. It can feel really liberating to express your needs or desires out loud. Phrases like “that doesn’t work for me” are simple ways of being assertive. Repeat what you want as often as necessary. 3. Start Small and Practice Until You Get Strong. You can build your assertiveness the same way you build any muscle: exercise. On a daily basis, practice speaking up about your needs, big or small. When you speak up about things that are less controversial—such as accepting additional work, where to go to lunch or requesting help unloading the dishwasher, people around you get used to your assertiveness. It becomes easier for you to practice and for others to hear. Also, when bigger issues come along you will have a healthy process in place for dealing with differences, and you’ll have greater self-confidence. 4. Give and Get Respect. Assertiveness is a two-way street. If you want your boundaries to be respected, you must return the courtesy. Pay attention to what others request of you; if it is reasonable and not harmful or hurtful, agree. If you are the one who constantly makes accommodations, you have to speak up and clearly say no while stating what you want or don’t want. New behavior is awkward. Practice until it feels natural and comfortable. Be consistent with your actions because actions do speak louder than words. People respect those who speak up and communicate clearly. Your personal courage will help you to be brave. Want to Get More Things Done?